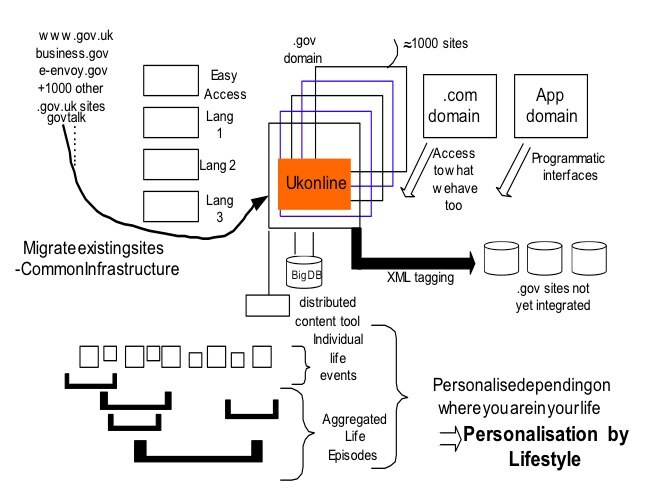 Is what Alpha.gov.uk (and the soon to be beta.gov.uk) are doing really different? I mean, it's a website, right? We've had a few of those before, more than a few (thousand) in fact. 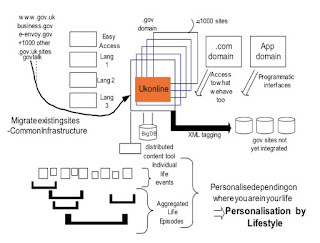 As someone who used to do, in the Office of the e-Envoy, what the Government Digital Service (GDS) team (formerly the alphagov team) are doing, I watch their progress with interest, applauding the successes and wondering about the things still to do, occasionally scratching my head. I was part of a team a lot like the GDS team. We had a bunch of hugely talented people drawn from inside and outside of government (plus quite a few secondees from major technology companies too); we published a lot of what we were doing; we took on some difficult projects (some right at the very edge of what was going on in industry let alone in government); we worked hard to draw other departments in (we often had to pitch for them to use what we were doing during a competitive tender process; we used open source products; we did work for other departments who commissioned us to build things; we put in place things that, 10 years on, are still in place now and drawing ever greater usage; we built things from scratch, used beta products, and integrated some complex stacks; we even used the first cloud service in government in 2001 when we paid by usage and didn't own any assets; we worked across government to write and edit content; we dealt with accessibility from day one with the aim of creating the most accessible sites; we tried to lead the way in doing things in a different way; we, too, dealt with the long tail of the vast range of services that government offers; we did things, like MessageLabs anti-virus, that weren't strictly in our remit but felt like the right thing to do; we lived and breathed our services, taking it personally if there were problems or if customer were not happy. So are GDS all that different? My sense is that they are, and they aren't. They're doing what we did, and more, and better. And they have some things to work on - based on current progress, I'm pretty confident that they'll sort those out too. The team - there is a greater focus on people already inside government. In 2001 we tried hard to recruit civil servants into the team but often failed to attract many (or, indeed, any). The Cabinet Office wasn't seen as the place to do what we were trying to do; it wasn't a delivery department. We had some great civil servants for sure, but not enough to make them the core of the team. The GDS folks, and the Alpha team in particular, have attracted some terrific people into the team, even converting some outsiders into insiders along the way. The process - this is open government in action. From 2000-2005 we published almost everything we did, but almost always to those inside government. We were amongst the first (and probably actually the first) to make available every detail of the volumes, the service delivered, the product roadmap and so on; the team often spoke at conferences but the audiences were mostly other government people (and the larger suppliers). GDS are publishing pretty much everything they do, including decompositions of decisions made (particularly the ones that have attracted criticism), via blogs, twitter, the press and doubtless other routes. The roadmap - I get the sense, and I don't know this for sure, that the alpha team don't know where they're heading with each piece of work they start, and I mean that in a good way. When we started work we had to bid for money, build requirements list, test the requirements with customers and deliver what we said we were going to deliver. We wiggled a little as we went but we pretty much got to where we had said we were going to, for better or worse. These guys are working in a much more iterative way, shifting left and right to work around some problems or to add in new capability. The beta will, I hope, evidence that approach even more. If we'd had any obvious political link there would have been a lot of trouble. Things change, of course, but my view is that these two shouldn't mix (and I don't mean the PM and Deputy PM). The public ministerial support is, though, a brilliant thing to have in your pocket. A single great website is, of course, essential for government (I think my position on that has long since been clear). 27 million people a month visit the existing direct.gov.uk but it has remained largely untouched since I left it in 2004/5 (it's had a technology refresh and significantly increased functionality, but it still looks and feels largely the same - that is meant as no slight to the team who have worked diligently to upgrade it and keep it fresh, just an observation that it's still orange and looks much the same). For instance, the screen shot on the left is from 2007, the one on the right from 2011. But transactions are where it's at. We built the government gateway to support both single transactions and joined up transactions (that is, ones that would link more than one department and send each of them the relevant data. The vast bulk of those transactions come from sites other than direct.gov; the vast bulk of direct.gov's transactions are for Car Tax. That all needs to change. We didn't ever crack it. It needs cracking - integrated transactions, simple pan-device (and even pan-channel) authentication, pre-population of data that government already knows about you and so on. We built tools and services for all of government to use. Our aim was to massively reduce spend on technology by building something once that could be used by many. It was a great aim then and it's still a great aim. I don't yet see where the GDS team are going with this. Folks in government are still building and rebuilding websites - I know of a dozen that have gone live this year alone and that's only the ones that I know about. As Simon Dickson has argued before, there's a great case for a lightly centralised service supporting government entities that still need their own site. I say "lightly" because I think there's a need for two or three competitive offers working from consistent templates with each innovating and improving as well as co-operating and sharing. We regularly confronted the question of whether to build something ourselves or to use existing products. With the gateway, we used a not-yet-released to market Biztalk which needed around 100,000 lines of custom code to get it to do what we wanted. Microsoft took all that we had done (under licence) and released a new version a year or so later which did all that we needed and left us with only 8 lines of custom code. When looking at the engine for direct.gov (and later dh.gov and several other sites), we looked at Vignette, Stellent and others but went with a custom build - that was a difficult decision and one that proved wrong in the end as the engine was subsequently scrapped and replaced by Stellent. GDS look to be going custom again which is likely to prove interesting perhaps 2 or 3 years from now. We also confronted the issue of how much to do in-house and how much to outsource. We were lucky to have a great skunkworks team who could rapidly build proofs of concepts, but we went with suppliers for all of our production versions (and we hosted with them too, not having a real cloud supplier at the time - plus we were also tied in knots by the Critical National Infrastructure badge, one that we wore with pride at the time but one that, in hindsight, was plainly an albatross). Keeping everything in-house, managing turnover of staff, staying on top of emerging developments, dealing with 24 hour support, knowing that the only people in the way of criticism is your own team etc is a tough place to be - we were there too, but we had dozens of supplier people working for us too, so at least the load was spread. In the end, GDS will make their choices on each of these and a million more decisions. I hope that they recognise that, whilst it may all feel new/different/special, some of what they are doing has been done before (not just during the time of the Office of the e-Envoy around but by people in the 25 years before, dating all the way back to the computerisation of major transactions like PAYE). Lots of lessons were learned and lots more will be learned from here on. It would be good if the ones learned again aren't the same as the ones learned before. Alpha and all that follows it needs to part of a long-term delivery plan, one that shows how the Government's ICT strategy will be implemented (a document describing that is due out any day now I believe). But it also needs to be part of a wider delivery plan that shows what will happen within and across government where the real world services will be challenged in the same way as the technology ones are being (and have been). Technology can create a veneer of joined up capability but it can't truly transform the services in and of itself. I will keep watching with interest because the challenge they're taking on is the right one to undertake and because I believe in it too. This is a new time in government. Maybe it's even a new 50 year storm.